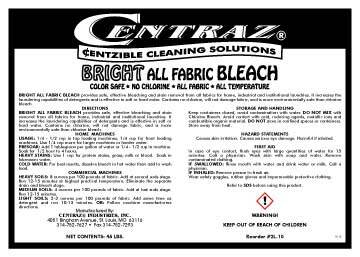 Laundry – Centraz Industries Inc.
Bleach 10 is designed to remove tough, stubborn stains from white and colorfast fabrics (view technical sheet for recommended uses). 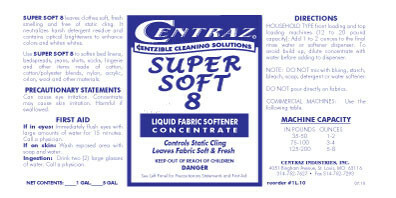 Super Soft 8 is a fabric softener concentrate to be used during the rinse cycle. It contains fabric softener, optical brighteners and a pleasant light fragrance. It is designed to be used in automatic laundry systems or in household style machines in the final rinse cycle. Dual is a highly effective dual surfactant detergent lightly build, moderate pH, containing anti-redeposition agents, optical brighteners and fragrance. In system applications it is designed to be used with pH Plus alkali. Clean Cept is a totally non-ionic detergent for use with the newer Consept linens, or those linens where cationic and anionic detergents are not recommended. Usually used with pH Plus Alkali to achieve excellent results. 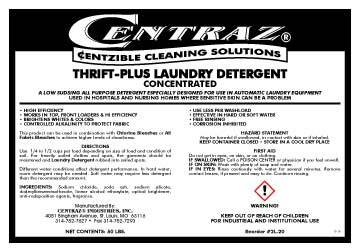 Fabric softeners are cationic and therefor are not used on newer linens/bed pads that tout high absorbability, and thus not usually used with Clean Cept detergent. Dual Plus is the same detergent as Dual, but with the added benefit of fabric softener. 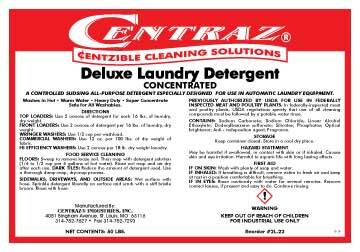 It is usually used without pH Plus alkali in non-system laundry applications. pH Plus is a liquid alkali booster that can break dirt and grease free from fabric during the wash cycle: detergents emulsify grease and oil after being released from fabric by an alkali. Sour-Soft with Fluorescent Brightener is a stable liquid sour/softener concentrated sufficiently to allow both sour and softener to be effective at relatively small dosages. Sour Nu is a stable, rust-removing liquid sour. It contains stain-removing agents and is freeze/thaw stable. 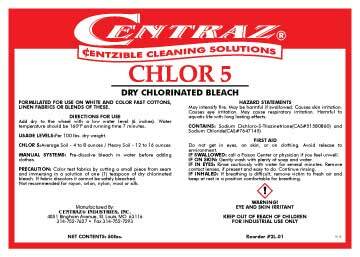 Chlor 5 is a powdered laundry bleach that is designed for use in industrial and institutional laundries. Bright All-Fabric Bleach provides safe, effective bleaching and stain removal from all fabrics for home, industrial, and institutional laundries. Thrift Plus is a concentrated laundry detergent powder formulated for economical detergent applications. it contains the finest high-density raw materials to achieve low usage rates. Delxue Laundry is a concentrated laundry detergent powder formulated with phosphate for economical high detergent applications. 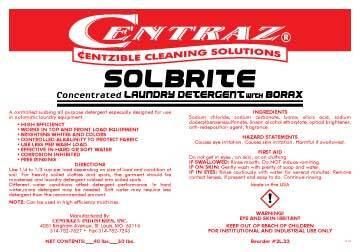 Solbrite is a non-phosphate laundry detergent powder for use in automatic laundry equipment and home style machines. At levels of 1/3 to 1/2 cup per 22 lbs. of laundry, excellent cleaning is achieved on lightly to moderately soiled laundry. For more heavily soiled laundry, 1/2 to 3/4 cup per 22 lbs. should be used. 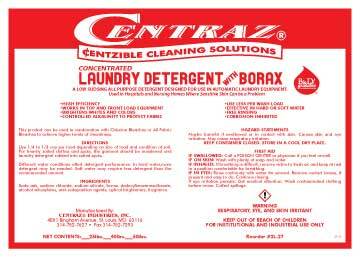 Laundry Detergent with Borax is a non-phosphate laundry detergent powder formulated with borax for whiter, brighter, fresher clothes. It's effective in both hard and soft water!